Large sundeck. Teak table seats 8. State and local taxes of 5.7% will apply. 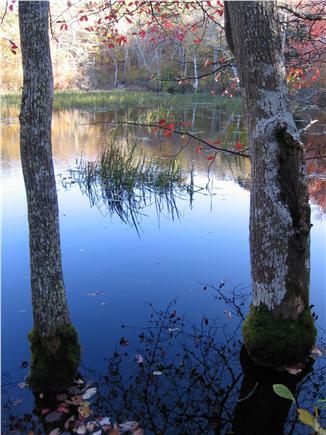 Come to a delightful woodland setting next to the State Forest. 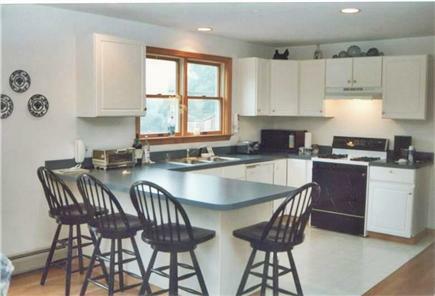 Our two-story, year-round Cape, built in 1994, sits on one-and-a-half acres --- just a short walk from the State Forest bike path and Greenlands trails. Bright & airy with ceiling fans throughout --- and Air-Conditioning if needed, this well-appointed home sleeps six comfortably. The dining room seats six people. In addition, the house boasts a well-equipped kitchen with a 5-seat breakfast counter, a new gas stovetop with an electric oven, a new dishwasher and a new fridge. 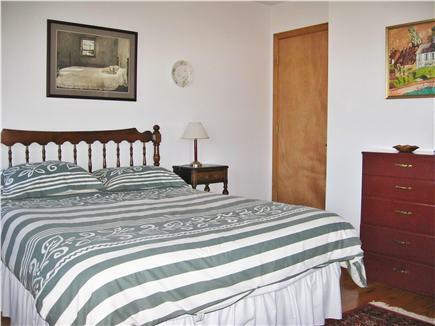 Three attractively decorated bedrooms, two upstairs and one downstairs, offer comfortable bedding: two queens and two singles. Bed linens are included (but not towels). 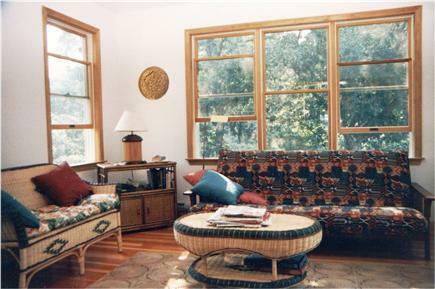 On the first floor, the living room has a bay window view overlooking one of our flower gardens. 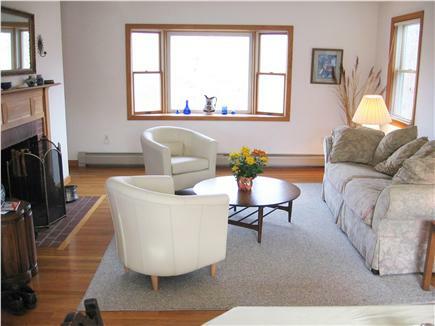 French doors lead to a lovely cathedral-ceiling sun room where we provide Wi-Fi internet, cable TV, a BluRay/DVD and a radio/CD player. Beyond the kitchen, a full-size laundry is adjacent to the first floor bath. 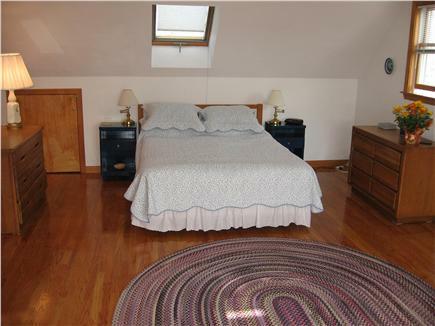 An elegant first floor bedroom with queen bed is nearby. 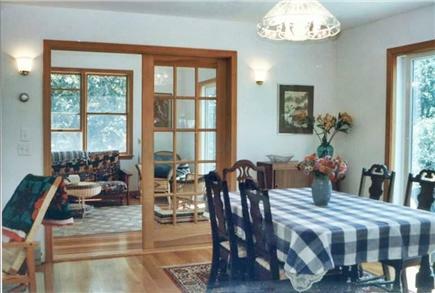 The dining room looks out on to a large rear sundeck and an extensive lawn surrounded by woods. 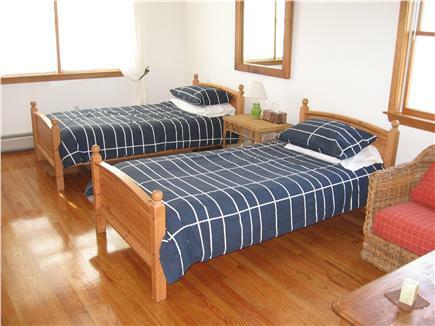 The second floor has a spacious master bedroom with a queen-size bed, a second bedroom with two twin beds, and a full bath in between. Hardwood floors run throughout the house. 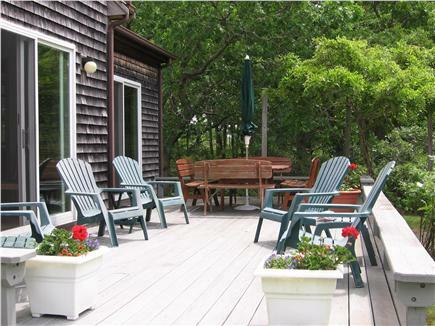 Outdoors you will find front and rear sun decks adorned with decorative flower boxes. The rear sundeck has a large teak table with umbrella that seats eight and a grill patio with a Weber gas grill and a charcoal grill. Enjoy a soothing private outdoor shower. Take a nap in our hammock. Play croquet. 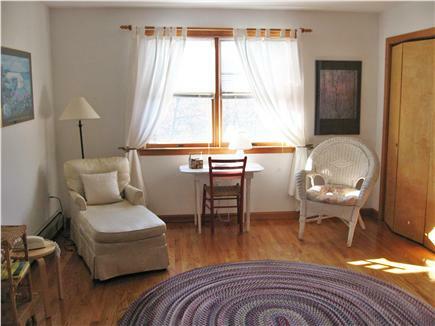 Our house and its grounds give families lots of room to spread out in a tranquil wooded environment. Flowers are everywhere. 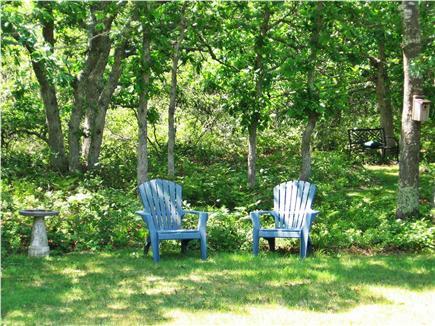 As our guests, you will have access to West Tisbury's private Lambert's Cove Beach, a nearby private association swimming pool and a tennis court, each nestled in the woods. 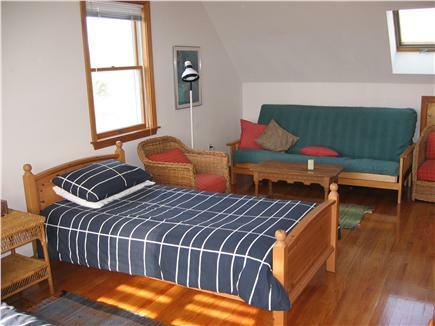 We also have Beach Chairs for your use in the basement. 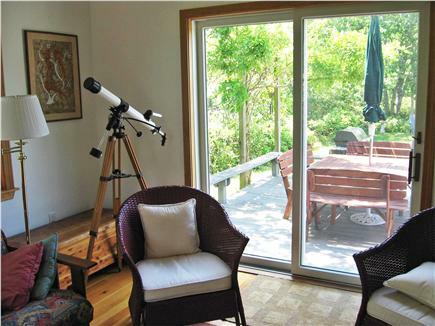 The house is centrally located on the island within easy reach of Vineyard towns and attractions. While the house sleeps six comfortably, it also makes the perfect romantic getaway for a couple, both during summer and off-season when rates are lower and crowds have thinned. 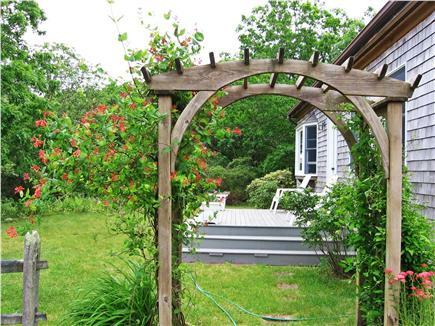 Spring and Fall on the Vineyard are lovely. Accessibility: A three-step entry way with a solid handrail and a comfortable first floor bedroom, bath and laundry make this home more accessible for elderly guests. Our no-pets and no-smoking policies help to reduce allergens. We often have owner-transferable Steamship Authority Ferry Boat Tickets for your car at cost for selected weeks in July and August. Call for details. Booking Information: To complete your reservation, send us an email and also telephone us to confirm the booking dates and payment details, and to furnish your mailing address and other contact information. NEW LODGING TAX. Please note that effective July 2019, all homeowners renting vacation homes are now required to collect a new State and Local short-term rental tax, currently in the amount of 5.7% of the lease amount. This tax will be in addition to the posted rental cost. When you arrive, here are some of Martha's Vineyard Island’s Attractions: Dining at many fine restaurants, beautiful beaches, scenic vistas, swimming, fishing, boating, tennis, bicycling, walking along miles of picturesque Land Bank and other conservation trails, the Polly Hill Arboretum, shopping in island towns, antiquing, island art galleries, craft shows, glass blowing demonstrations, MV Agricultural Fair, concerts, comedy improve theater, musical performances, special events.... and lots more fun. We will look forward to hearing from you and answering your questions about the house. Send us an email and give us a call! Additional pricing info: Departure Cleaning Included. Returnable security/damage deposit $400. State and local taxes of 5.7% will apply. 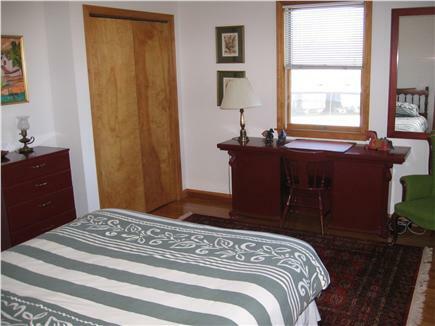 The first floor bedroom offers a queen-size bed and is in close proximity to a full bath, laundry and the kitchen. The adjacent entry door to the house is equipped with a handrail to help with three steps. Thank you so much for having shared your lovely home with us. My father and I had a wonderful time on the island. Lambert's Cove Beach is magnificent. Morning Glory Farm and the Farmer's market in West Tisbury were a real treat and fresh lobster rolls at Larsen's at sunset were great. We hope to be back on the island soon. Thank you again for sharing your beautiful home. As always, we had a wonderful week. From our Guest Book: We thank you for sharing your lovely home with us. 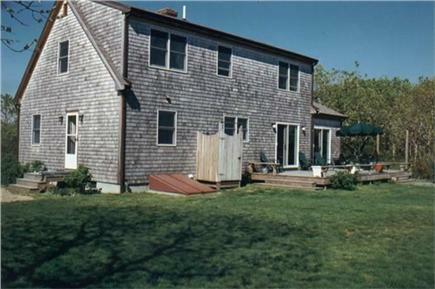 We have been coming to the island for 28 years and we now know (that your house) is the perfect fit for our family. See you next year. From our Guest Book: Thank you for another fantastic week at 321 Great Plains Rd. Everything was perfect, as usual. See you next year. This was our first trip to Martha's Vineyard, and we could not have had a better time. 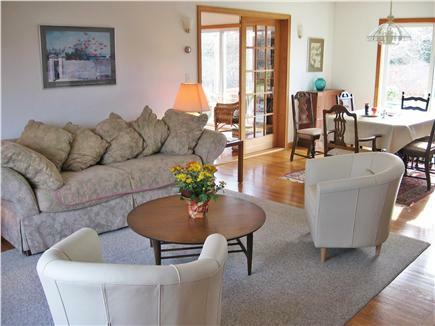 Your house is so relaxed and comfortable, and the perfect home base to explore the island. Our two young boys loved the deck and the yard. We cannot wait to come back again. Thank you! We had such a wonderful time in MV staying at your house. We played board games, grilled, relaxed on the hammock and made wonderful memories. We visited the pool, went to the beach and explored the island. The house was beautiful, it had everything we needed and really helped make this a wonderful trip. We would love to stay again. 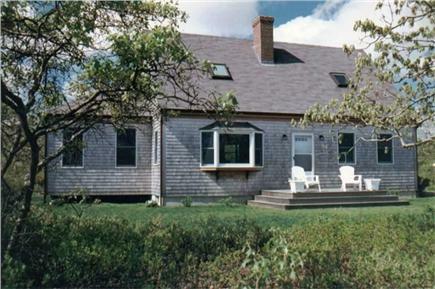 A Beautiful secluded home on the Vineyard. This home is simple but clean and very homey. 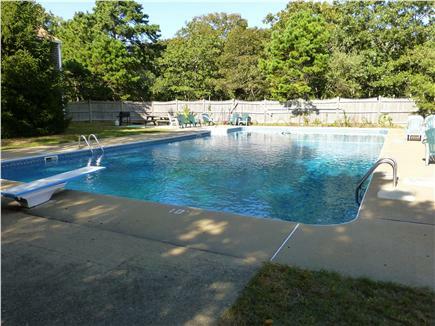 It's very well maintained and has a great yard. The owner is extremely nice and attentive. Highly recommended. 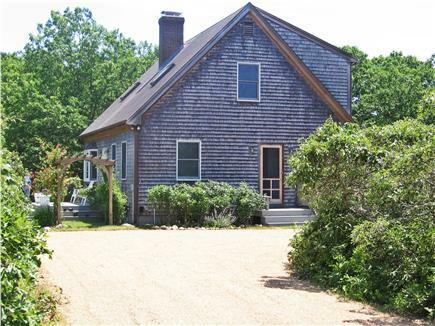 My wife and I have been offering our beloved West Tisbury home to vacationing families every summer since 1995. Our goal has always been to offer as carefree and tranquil a setting as possible, one that will make our guests want to return to our home year after year. We try to ''think of everything'' that might enhance the comfort of our guests during their visit. In this, we are happy to have succeeded. We are fortunate to have many of the same families returning for their weeks year after year; several families have been returning for more than a decade. One family is in its 20th year. I can't tell you how gratifying it is that so many people share the love of our home and the lovely island upon which it sits. We are near the end of a long, paved road that that borders on the W.T. Greenlands and ends at the north side of the State Forest, a short walk to the bike path that rings the State Forest. 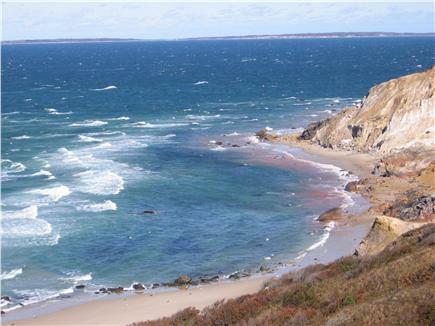 West Tilbury is a largely rural part of Martha's Vineyard. Our house sits roughly in the middle of the island, allowing easy access to all parts of the Vineyard.